Still looking for a gift for that someone who has everything? 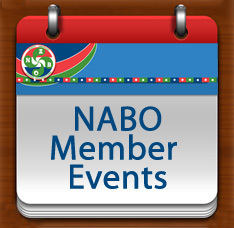 How about a NABO Calendar? 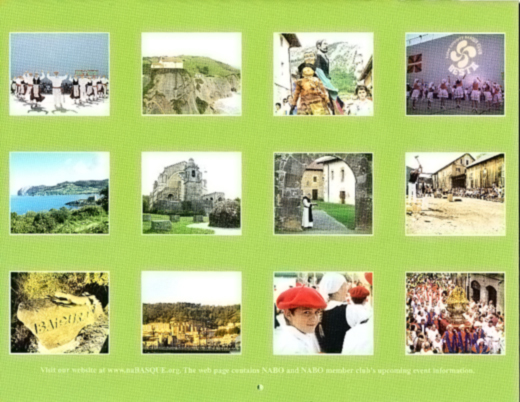 The 2016 NABO calendars are now available for $5.00 plus shipping and handling and can be purchased by emailing Calendar Chair, Mary Lou Urrutia. They also make great gifts for family in the Basque Country, since they are in all four languages. The New York Basque Club invites everyone to join them for their San Tomas celebration on Saturday, December 12th. The party will run from 4-7pm and will include games for the children. After 7pm the bar will be open and Basque cider will also be served. There will also be pintxos and sandwiches, including txistorra, xolomoa, tortilla and other specialty pintxos. Food will be available to purchase until 9:30pm and a DJ will also provide music for dancing. To RSVP or for more information, email: Gari Udabe, Leyre Areizaga, or Iban Ubarretxena. 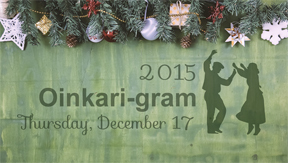 The Oinkari Basque Dancers are introducing Oinkari-grams this holiday season to spread some "Basque Holiday Cheer." Like a singing telegram, the Oinkari-gram will bring a group of 2-4 dancers in costume to a house of your choice to perform a Basque dance and read a special note from you out loud. Oinkari-grams will be delivered to the Boise/Meridian area on Thursday, December 17 from 6-9pm. All proceeds will go towards the group's 2016 educational trip to the Basque Country. To purchase an Oinkari-gram, please visit their website. Deadline to purchase is Sunday December 13th. As promised last week, today we are sharing stories and photos of NABO organizations who sent us information on their Euskararen Eguna activities. 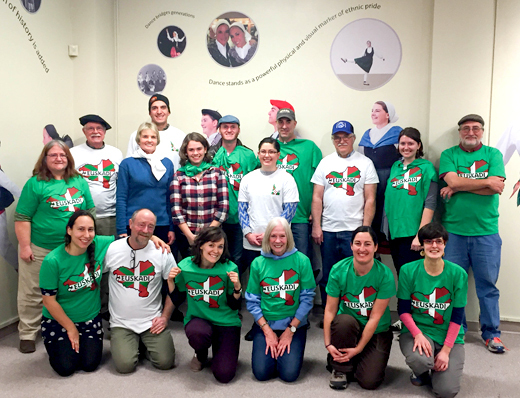 Our thanks and congratulations to Iparreko Ibarra Basque Club and Basque students in Boise! 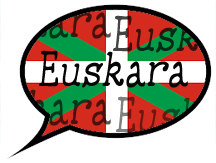 Members of Iparreko Ibarra Basque Club celebrated Euskararen Eguna with a Basque language class. 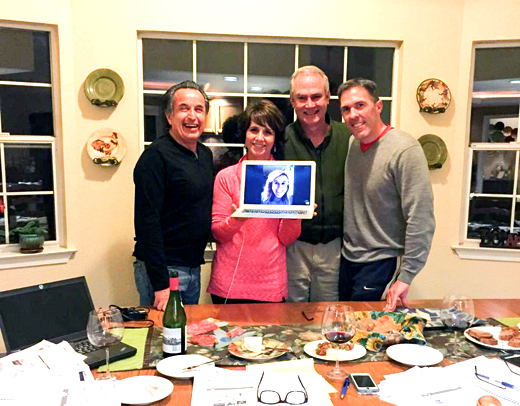 Left to right: Michael Uro, Janine Marticorena, Blake Stevenson and Gilbert Petrissans. Their instructor Esther Ciganda is on the laptop screen as they were skyping between the Basque Country and Rocklin. Boise Basque students met on Monday November 30th to kick off the celebration of the international day of the Basque language. It was a very successful event where students got to participate in workshops with the common theme of "Euskera." The event included a Basque singing workshop, Basque dancing workshop, bertso writing workshop, a photo booth and a txalaparta workshop. In addition, there was a lot of food and drinks that accompanied the rural sports competitions that we had amongst the 3 Euskera classes. Each student received a free T-shirt. 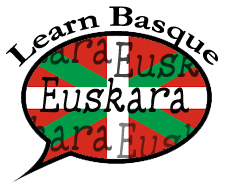 Several students expressed that they were happy to have events like this, which reminded them why they should continue learning Euskera and gave them a chance to meet new students from other levels that are also learning Euskera. 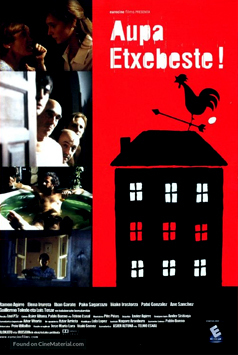 To conclude the celebration there was a a screening on December 3rd to watch two documentaries: "A Quick Jota Through Basque Dancing History" by Oinkari Basque Dancer Mikaela Schomberg and "Euskara Munduan" by Basque Country documentarian, sports announcer and musician Inigo Asensio.